So sorry for the other night when my husband had a five-ton truck stuck in your driveway. Thank you for parking in ours while we waited for the tow truck. Also sorry about that patch of grass and for what was surely a lot of swearing coming from said husband. 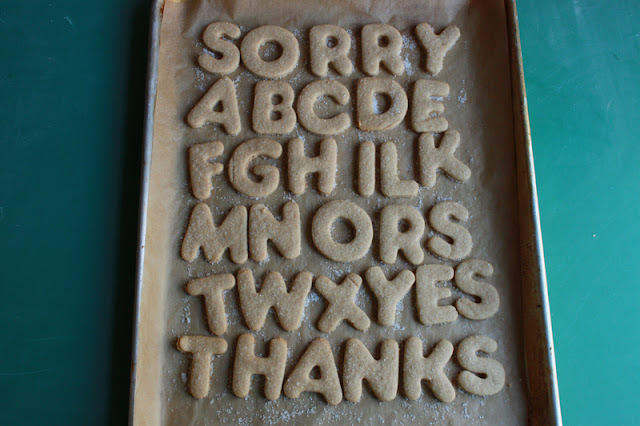 I hope your little boy enjoyed seeing that semi-truck lifter pick that five-ton off the ground and that you will accept these Whole Wheat Sugar Cookies as a token of both apology and thanks. A comedian once bemoaned the use of cakes for special happy occasions - he said that when you really need a cake most is when things go bad. He went on to say that delicious cakes would be much better than a "Dear John" letter or a pink slip. 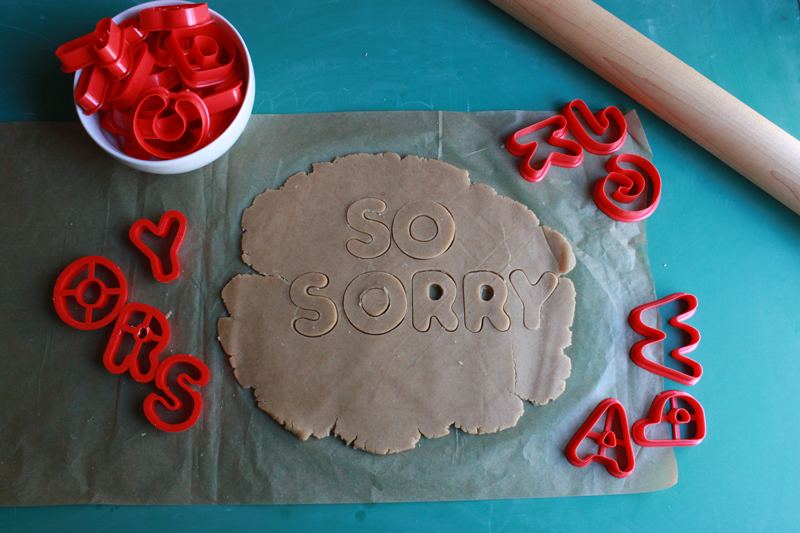 I always chuckle at the thought of a cake who's frosting might read "Its not me - its you." I wish I could remember the comedian because I couldn't agree more. Food is one of the ways I show my love and affection for people. It is also how I try to lift up others, because I often feel awkward and say the wrong thing when someone needs a shoulder to cry on. I cannot actually write out the sentiment that is on my heart in a casserole, but I damn near try. The last few weeks of married life have been hard; My husband has been working a ton (a blessing, I know!) and is exhausted. When he is busy, I get busier too, because the tasks we normal share still need to be done, making us both tired. We hardly have time to catch up on the day-to-day ("Did you call the accountant? Oh, Ella said this today") much less connect in a meaningful way. There has been more arguing than I'd like to admit. Recently, in a conversation my boss said "Oh, of course you don't want it to be easy - that's why you got married!" He meant it to be funny, and it was, but it stuck with me. Relationships, especially the long lasting ones, take a lot of work and they aren't easy. I'm working on, in the best way I know, being sweeter to my husband, to tell him I love him without saying it or even seeing him. I set the coffee pot for him every night. I make sure there is beer in the fridge. I baked these simple, sweet, cookies for him (and our neighbors), because I didn't have time for a cake and this is one of those times when we need sweetness the most. 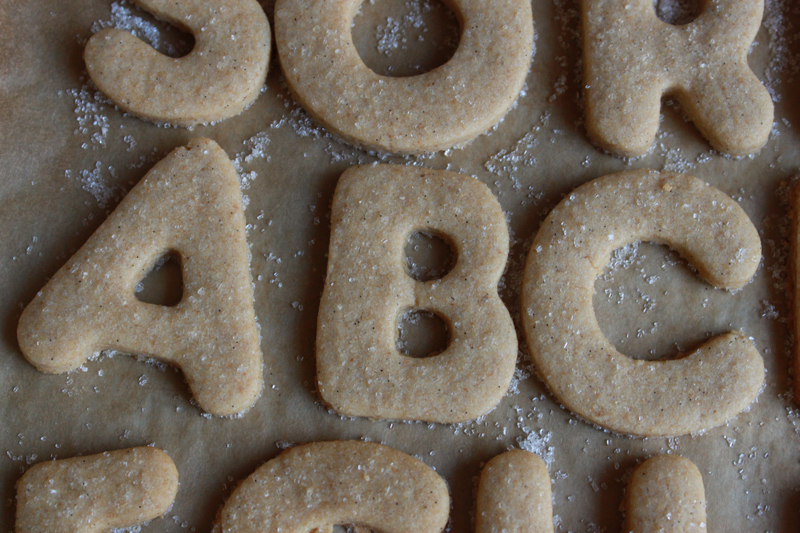 These sugar cookies are simply delicious. 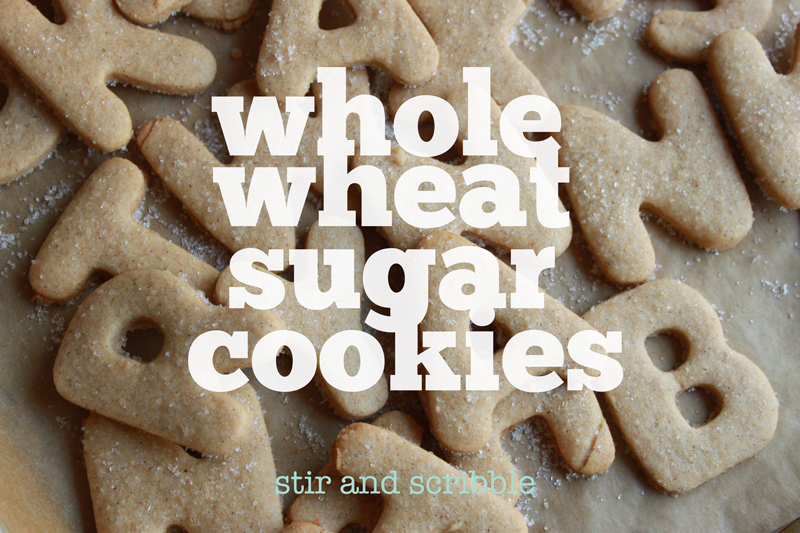 The whole wheat flour adds a nuttiness and delightful toothsomeness to them. You'll be surprised how many cookies one batch of dough will yield, so consider freezing one of the disks for future cookie cravings (or apologies). Whisk together the flour, soda, and salt in a small bowl. Set aside. Cream together the butter and sugar until lighten in color and increased in volume. Add the egg and beat well. Add the vanilla bean and extract and stir to combine. Add the flour and beat until well combined. Divide the dough into two disks, cover with plastic wrap, refrigerate for at least an hour before rolling. Heat the oven to 350 degrees F. Roll the dough to 1/8 inch thickness between two pieces of parchment paper. Cut into desired shapes. Arrange the cookies on parchment lined half sheet pans and chill for at least 10 minutes. Repeat rolling and cutting with the remaining dough. Sprinkle the cookies with sanding sugar and bake for 10 to 12 minutes until just lightly browned. Cool completely on a cooling rack. This is a discussion we have a lot -it doesn't get easier - you just learn to cope with it a little better and attitude is everything. Thank you for reading - it means a lot to me.